WTSO (Wines 'Til Sold Out) is one of the original flash sites set up to help liquidate the glut of surplus higher-end wine that flooded the market back in the Great Recession. Unlike so many others that have folded, WTSO has managed to cultivate a loyal following of enthusiastic customers who enjoy the big discounts - and free shipping options. In the spirit of keeping things interesting, WTSO recently introduced Bonus Offers, a way to offer buyers more choices than the single bottle being offered for sale. To help draw attention to this new feature (and probably dispel concerns that "bonus" could mean plonk), their people sent a sample of one of their bonus wines. Plonk it is not. I'll be checking into this more in the coming days/weeks. From the lackluster 2011 vintage comes this overlooked pinot from a pedigreed vineyard in the Russian River Valley. According to Sojourn’s website, the current vintage of this wine (2015) retails for $48 a bottle, so it's not really a bargain unless you're willing to risk the vintage/age factor....at six years old, you'd be smart to wonder if a domestic pinot noir could be over the hill, but you'd be wrong in this case. The nose is full of lively, sophisticated varietal character. Soft and round, the mouth is expansive in its range of spice-framed tea-tinged flavors. 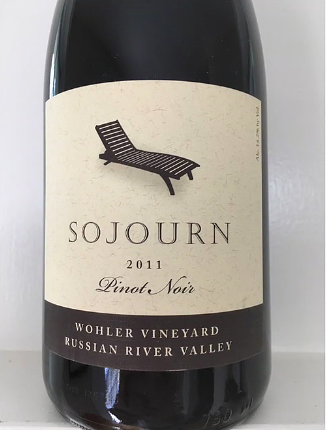 This wine is terrifically true to both variety and place as it straddles the vulnerability of pinot’s lightness with the powerful cola and sun-baked influences of the Russian River Valley. Not even close to over the hill. Really enjoyable.